To those of us fluent in high fructose corn syrup, the Valentine’s Day season never feels like much of a season at all. The candy aisles are dutifully decked out in that confounding combination of pink and red as soon as December 26 rolls around, but a phalanx of Cadbury eggs, plastic baskets, and plush bunnies are always hovering just behind, awaiting their (likely more profitable) advance onto shelves. Confectioners seem to give Valentine’s Day a purely perfunctory acknowledgment, presenting the bare minimum of what people expect: heart-shaped this, sentimental that. All in all, it feels like the industry’s asleep at the wheel. I don’t just want tiny classroom-giveaway-sized versions of the candy I already eat (literally) every day. I want innovation! Distinction! 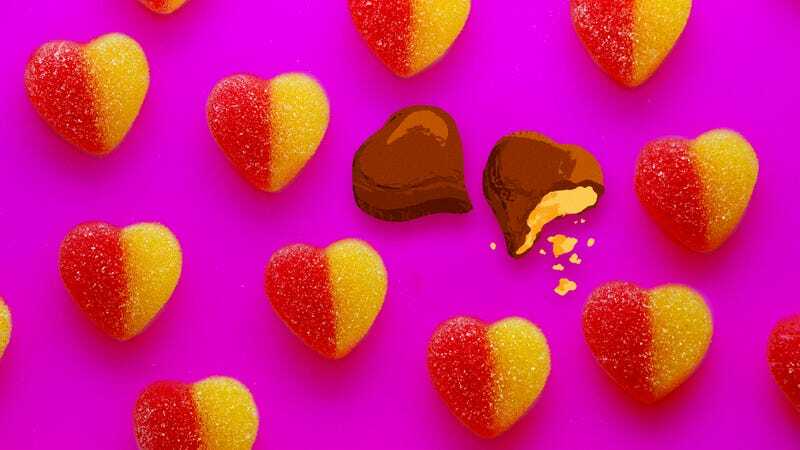 And the year 2019 needs it more than ever, what with Necco’s acquisition-related candy heart shortage; these tiny hearts, like candy corn, have always been a divisive but dependable seasonal staple. So, the question becomes: Which Valentine’s Day candies feel (and taste) specific to Valentine’s Day, and are they delicious? Follow me, if you will, on my journey through the halls of CVS. Of all the items to sell out first, who would have guessed heart-shaped Peeps? February 14 follows quickly on the heels of December 25, in retail terms. This means that a lot of supposed “Valentine’s Day” offerings are in fact displays of excess Christmas inventory. Hot Cocoa Kisses and Ghirardelli Peppermint Bark both sound great, but I won’t be fooled by their generic wintry wiles. Moving on. Now, Necco might be in a bind this year, but plenty of other brands have stepped up to fill the chalky-conversation-heart void. Brach’s in particular is very excited to be holding the torch, so let’s investigate its interpretation of a classic. Perhaps Sour Patch Kids will provide a better interpretation? I was surprised to find that their version was not gummy (gummi?) in any way, but rather a thin, hard candy, SweeTarts-esque in both presentation and flavor. Necco, I eagerly await your return to the candy-heart space. As a candy company that’s comfortably inhabited its niche for 98 years, Russell Stover understands how to be a special-occasion confectioner. And biting into these delightful little pucks was a good reminder of what the company does best. With a thin, dark chocolate exterior that yields almost immediately to a moist, pillowy creme center, Russell Stover hearts are akin to a lighter Pearson’s Bun Bar, richly satisfying and the perfect size to feel like a substantial dessert. I didn’t really detect a lot of coconut or strawberry (more just the candy-sweet suggestion of each), but for 90 cents, I don’t expect to get a nuanced flavor profile—just something that feels like it was made special for Valentine’s Day. That brings me to my next selection, which I want to preface by saying I did not commit a murder. This might actually be available year-round; there’s no branding that specifies it as February-specific. But I include it here because not only was it part of a flashy Valentine’s display and isn’t something I’ve seen on shelves before, but also, this offering seems to hit at the heart of the holiday: an indulgent, romantic set of flavors suitable to share with your significant other. Dove has always been a bit self-important as chocolatiers go, but this particular bar is a fitting approach to the sexier side of this holiday. Plus, I’m always curious to see how candy companies interpret boozy flavors. I bite in. You know what flavor this candy bar is? Dark chocolate. And it is indeed a “silky smooth” and delicious dark chocolate—the best Dove has to offer—but despite the zebra stripes promising rivulets of vanilla and bourbon, my most attentive taste buds find none. This would probably benefit from being a creme-filled product, with a soft vanilla bourbon center within each breakaway square of the chocolate bar. As it is, it differs from a run-of-the-mill Dove bar in name only. Yet another missed opportunity to create a memorable, annually anticipated, Cupid-adjacent product. Sigh. Let’s see some real February innovation in 2020.